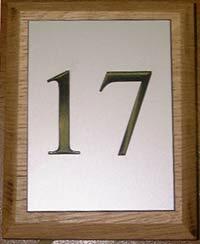 We have all kinds of house number signs, but there is always a place for the classic well polished brass house number sign. Brass is the traditional material for name plates and it is timeless. 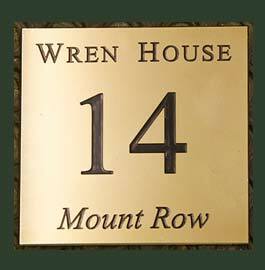 It can be just a simple house number or can include extra wording as the sign name plate on the right. 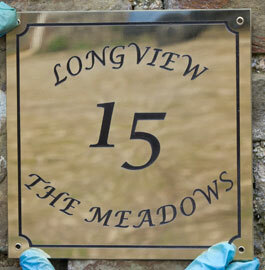 We use top quality engravers brass but as with all brass, it must be polished to stay looking at its best. It can be engraved in a range of fonts looks very elegant if mounted on a wooden backing board. It can include words as well as numbers. The letters can be unpainted or infilled black, blue, green, orange, yellow and red. The silver anodised aluminium is ideal for the more contemporary house number plate and it has the advantage of being tarnish free. It is also harder than brass and therefore more resistant to scratching. It can be engraved in a range of fonts looks very stylish if mounted on a wooden backing board. The letters are best infilled with black or blue. Words can also be included. Minimum letter size 10mm. 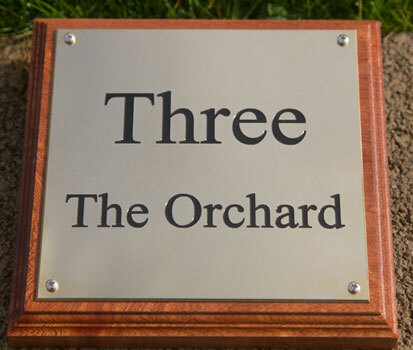 Our team at The Sign Maker looks forward to helping you with your engraved number sign.